A fall event that will light up the three Jardin botanique cultural gardens in grand style. It is a must-see event, and only from Sep 7 – Oct 31 (2018 dates). The lighted trees and sculptures are enchanting to see in the dark night. The Chinese Garden is the most elaborate presentation. There is a good Circle of Life presentation, projected on a tree, at the First Nations Garden. Allow 90+ minutes for entire visit. The Gardens of Light ticket is purchased separately and allows entry only at a specific time. That same ticket also allows access to the greenhouses in the botanical garden on that day. Touring that takes 90+ minutes and is worth visiting too. The greenhouses have plants and trees from all over the world. 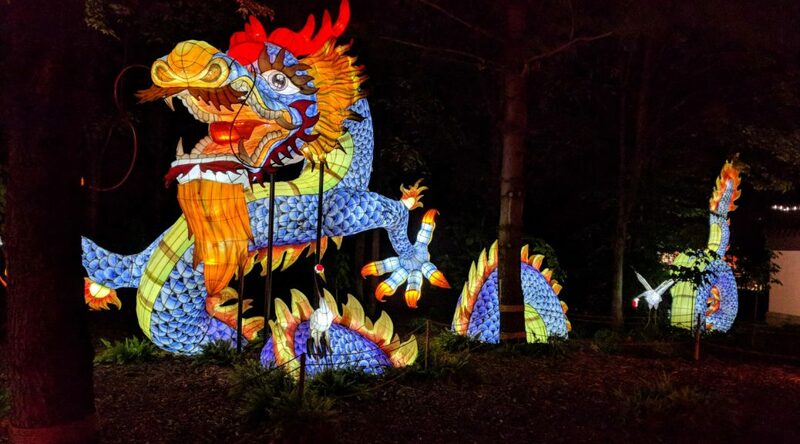 So arrive a couple of hours before your Gardens of Light time and visit both the greenhouses as well the lighted cultural gardens.